As you already have guessed, we’re big fans of food vendors in Bangkok. Mainly because they provide us with the delicious food we love to munch away on. When you go on a Bangkok sightseeing trip, be sure to use your tongue as least as much as your eyes when exploring the city. 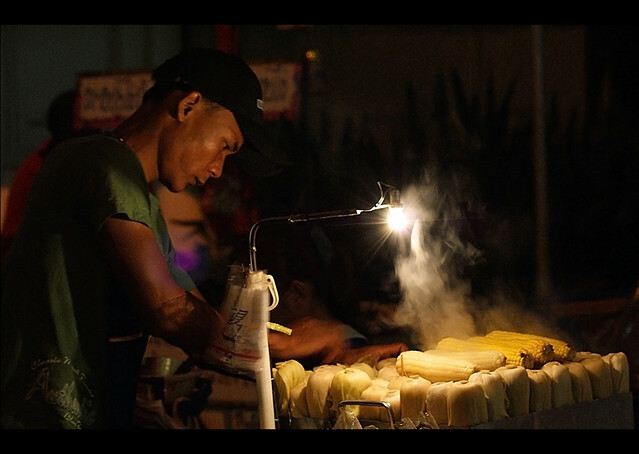 Here is a nice shot from a vendor who is selling corn – you find a lot of them, most of them come from Isaan, the north eastern region of Thailand where farming still is the main source of income. You can also often find purple corn here – which is a lot more nutritious than the yellow corn that most of us are familiar with. It tastes pretty much the same, but if you come across a vendor, give it a try, your body will like it.